The village postman of 100 years ago will feature in two evening performances of The Path Across the Heather, a production of drama, poetry, readings and music taking place during a special weekend to commemorate the centenary of the outbreak of the First World War. Hosted at the Town Hall by Silsden Local History Group, the weekend from August 8th to 10th will feature an exhibition about Silsden's part in the war, a children's corner and musical performances. The picture above shows Ray Colling as the postman and Bron Farrell (left) and Sylvia Wass as women of the Home Front who throughout the war knitted socks, wrapped parcels and raised funds. Above: these young women from Silsden belonged to the Masqueraders concert party, which serenaded wounded soldiers during the war. The Masqueraders are being revived by Silsden Community Productions for two evening performances (August 8th and 9th) at the Town Hall during the centenary weekend. Tickets (£5) for The Path Across the Heather and the accompanying Masqueraders entertainment are on sale at Twigg's newsagents. 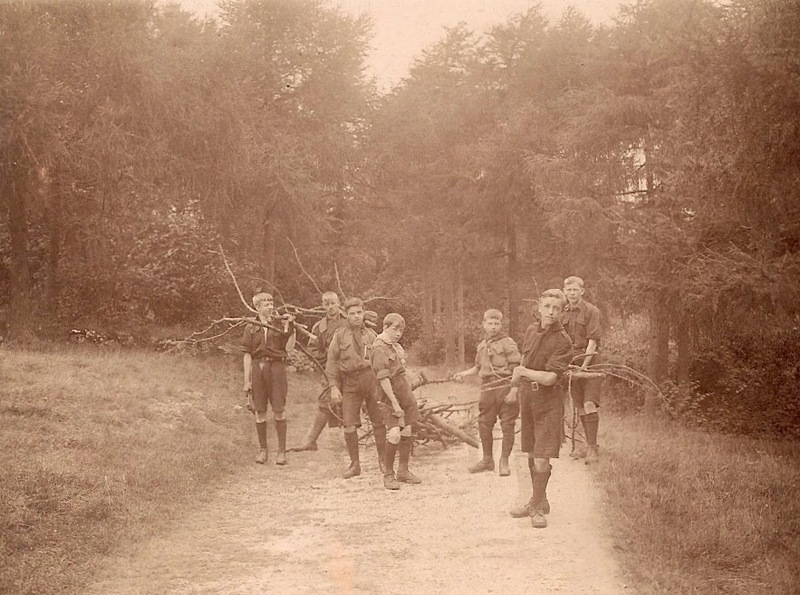 Above: this poignant photograph from 1913 shows Silsden scouts gathering firewood at their summer camp at Grange-over-Sands. Within a couple of years large numbers of scouts from the town's two troops were in training or already on the front line of war. Many did not return. The scouts in the this picture belonged to the 2nd Silsden (parish church) troop. Third on the left is Tom Stocks, who would die of wounds in France in April 1918. (Photograph by courtesy of Roger Bancroft.) The story of Silsden's scouts will be told in a major exhibition at the Town Hall from August 8th to 10th. Programmes for the whole weekend are available at the post office, library, churches and shops.